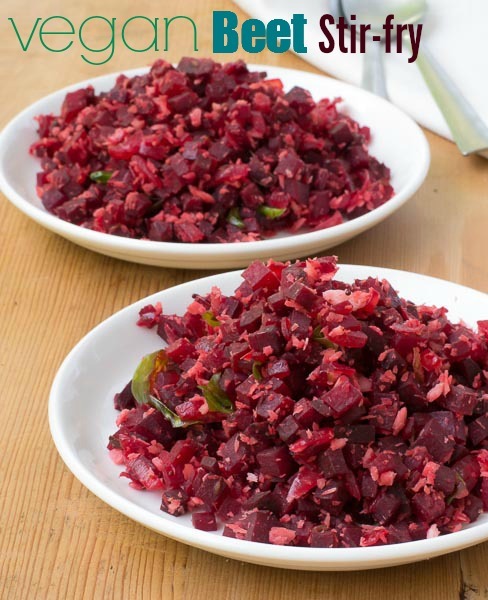 Quick and easy recipe for Beetroot poriyal . South Indian Tamilnadu style steamed vegetable stir-fry . Its healthy and vegan too. Beetroot is such a hearty and earthy vegetable. 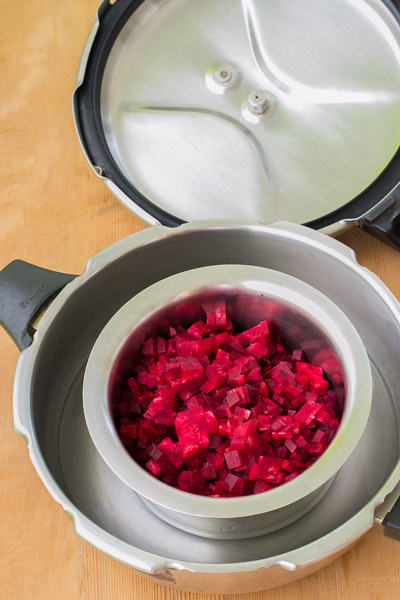 Whenever I peel beets, I smell the scent of rain on dry earth or மண் வாசனை – manvasanai as we call it in Tamil. Peeling beets is calming. 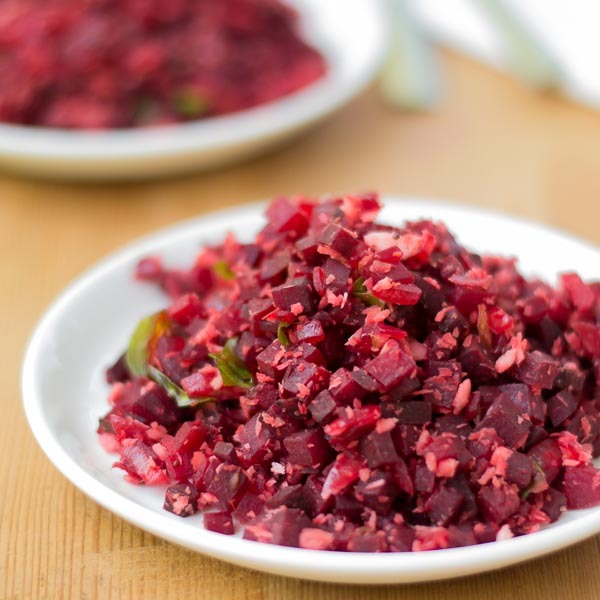 Beetroot poriyal makes for a very nice side dish. My young son has it with rice and calls the dish as pink rice. Its one of his favorites. Its an easy, healthy, straight forward recipe. First the beetroot is steamed and then its tempered the indian way. Nothing fancy out here. I have a trick for quick steaming the veggies. I put the cut veggies in a bowl and place the bowl in a pressure cooker filled with 1 inch of water. Pressure cook it for 3-4 minutes (2 whistles) and that gives perfect steamed vegetable every single time. Wait for the pressure to settle naturally. Heat oil in a saute pan and add in the Urad dal, mustard seeds, cumin and let it splutter. Add in the curry leaves, green chillies and the minced ginger. Fry for a minute. Then add in the onions and salt and fry till soft and tender. About 3-4 minutes. Add the beets and saute for a minute more. Add the shredded coconut and toss until combined. Switch off the flame and remove it from heat. Serve with rice. Heat oil in a saute pan and add in the urad dal, mustard seeds and the cumin seeds. Let it splutter. Add in the green chillies, ginger and curry leaves all at once. Fry for a bare minute. Add in the onions and the salt. Saute until soft and tender. Add in the steamed beetroot and saute until combined. 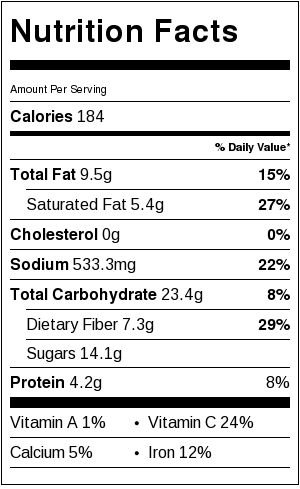 Add in the shredded coconut and toss to combine. this turned out so good! thank you!!! Lovely recipe! Thanks!! enjoyed it for lunch with curd rice. um..um..ummmm!! Very nice, and have learnt new method from my normal routine. Thanks a lot. Thank you so much. Glad that you like the recipe. Hi, I loved your easy to follow recipe. Just one comment. In your instructions it says steam the beetroot. I interpreted that as steam with pressure cooker weight. Later I understood that you meant pressure cook. Looks like recipe speak itself that how I’m delicious. Such a wonderful presentation, thanks for sharing it. Its one of my favorites too! Thank you Karen. There are a lot of veggie recipes on the site that are healthy and easy to make to. 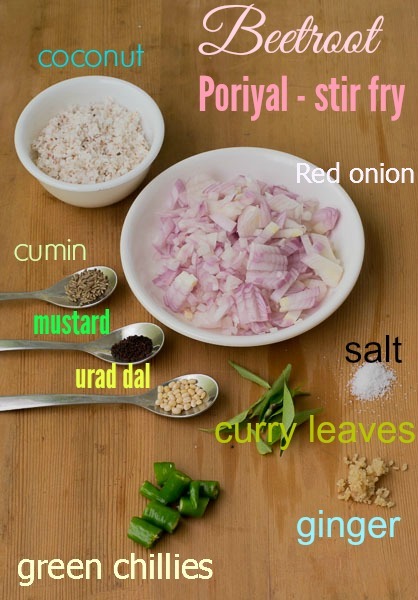 Refer to our poriyal/stirfry section in categories. Yummy,can we add asafotida in it too? Sure Aparna. If you like it you can add it while tempering!